Knowing how to paint a wall and ceiling is easier than many home-owners think, and it's not such a hard task if you know what to do and how to do it. A good painting job starts with careful preparations that will ensure you get great results, and preparations usually accounts for more than half the actual work involved in wall painting itself. First there is the need for you to evaluate what kind of painting works need to be done, and how extensive or otherwise the task will be. Secondly, you need to be sure that you can see the work to completion. No getting slack on the painting halfway through. Granted that some paint works can be challenging and may require you to contract it out to a professional house painter, nonetheless, most paint jobs that may need to be done around the home is quite easy to execute and fun to do, once you carry out the works at a comfortable pace. If you are reading this article, this is probably your first attempt at DIY interior wall painting. 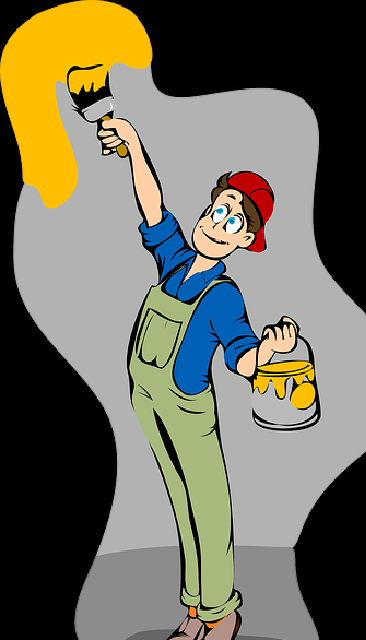 Well, wall painting is usually a breeze once the necessary preparations have been made. You want to avoid making a mess of your painting task, and it is easy to end up making a mess all over the place with a first attempt if care is not taken. Assuming you’ve chosen and bought the colour paints you desire, including painting tools . . . paint brushes, rollers, scrapers, collapsible step ladder, and the like, the following preparations must be done; painting tasks have rules that must be met! Move all furniture and other large furniture accents (floor lamps, potted plants, ottomans, etc...) towards the middle of the room, well away from the walls. If your room is small and doesn’t have that much space, things can be moved to other rooms that need to wait their turn to get painted. There must be ample room to manoeuvre and move around the four walls freely whilst painting. The less objects in the way, the better! With things out of your way, you’ll work more efficiently and faster too. Cover the floor around the walls well with some form of protection . . . rolls of ‘trash’ paper, old bed sheets, drop-cloths, or old newspapers. Old bed sheets can be used to cover the furniture and furnishings moved to the middle of the room. 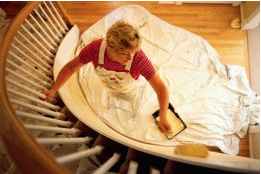 If you are a first-timer, painting can be a bit messy so try to cover all. Remove dirt and grime (if any) from the walls prior to painting. You can use a general household cleaner mixed with water. Dunk a foam sponge in the mix; squeeze out the liquid then use it as a wipe/cleaner for the wall wherever it’s needed or simply wipe clean with a damp cloth. Because dirt and grime interferes with paints adhesion to walls, grime, oil, filth must be removed. For heavy deposits such as grease, you can apply trisodium phosphate and allow it to dry completely before applying paint. Cover and/or mask things like fittings, switch plates, sockets, etc… with masking tape. It’s much easier to protect these than to have to clean smudges of paint after you complete your task. It is very important that you do this before wall painting commences. If you plan to paint cornices, trims and base skirts a different contrasting or complementing colour, you must also tape them wherever they meet with the soon-to-be painted surface. This will give you a better painting experience and you can be as creative as you wish with colour combinations. After the first set of preparations prior to painting, the walls themselves need to be prepared to receive the coats of paint. Repair and fill all existing cracks and/or holes. You will find it easy to do dry wall repairs as long as they are small or minor. Apply a primer to all repairs you have made. With extensive repairs, ensure it is well primed. This is essential especially if for instance you are using a different type of paint (latex or acrylic paint) over existing (oil based) paint. When your minor repairs are well and dry, prime the whole wall area that you plan to paint. You are now ready to proceed, but ensure you are dressed in some old clothes, a huge shirt over a pair of old torn jeans will suffice. However, if you can get some old overalls, that’s even better. When you paint, you must work from the top of the wall at the ceiling edge down to its base while following a natural progression that keeps each step moving in the right direction. Start working with the largest areas first then after painting the larger surfaces, proceed with the cornices, trims and wood works. Interior wall painting can turn out to be expensive it you contract the job out to some professional painter. Not only that, they sometime work at their own pace and make your house uninhabitable for as long as they are working in your home. They mostly hate to be rushed! However, painting your own home shouldn’t be so hard if you take the necessary preparations seriously. Your real investment is in the time you expend in doing the work. And you’ll save so much money by painting your walls yourself that you’ll have extra money left over to throw in a great area rug or a couple of accent pieces.